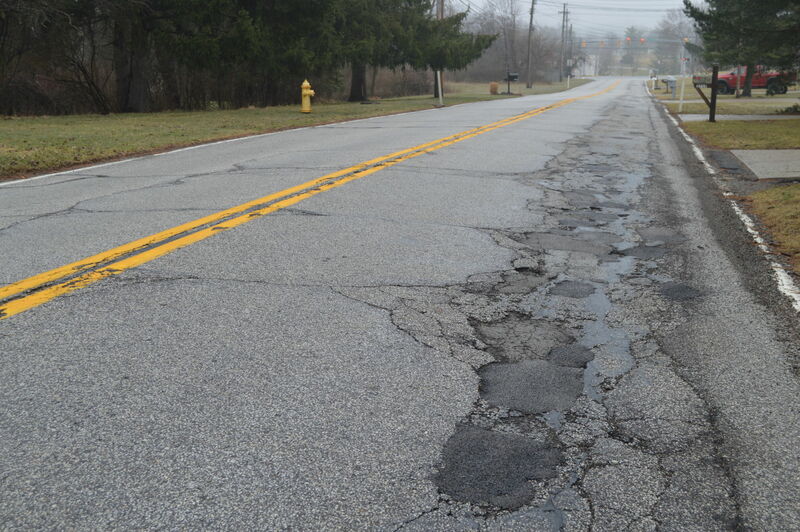 NORTH ROYALTON – The city administration is proposing to spend $1.4 million in repairs as part of the 2019 Roads Program. Mayor Bob Stefanik and Service Director Nick Cinquepalmi recently drove streets to survey their condition firsthand. The city typically takes a “worst first” stance when addressing roads. The roads proposed are: Bunker Road between Ridge and State roads; Maple Lane; North Akins, which lies between state Route 82 and Bennett Road; and Akins Road between Ridge and State roads. The roads would be repaired using the three-inch mill and fill technique, and the cost is estimated at approximately $600,000. The city is handling the bidding a little differently this year. Rather than pinpointing the roads first and then bidding them out, the city bid out the repair process earlier this year and will then apply that to the roads chosen. Crossroads Asphalt Recycling Inc. was awarded that contract. City Council was expected to approve the proposal during its April 2 meeting after The North Royalton Post deadline. “Mid-March we assessed the roads in the city and these are the ones that need to be done. We don’t look at wards, we look at the condition of the road. The money is already earmarked, it’s just up to City Council to sign off on these roads,” Stefanik said. The city typically spends $1 million plus for its annual program, and the mayor said he believes the city has done a great job staying on top of repairs. “When you look around at our roads, they’re in great shape, they really are,” he said. Each year, spring road rehabilitation work, which includes extensive patching, joint repair and concrete slab replacements, is also performed as part of the roads program. Close to $800,000 is earmarked for these repairs this year. The city went out to bid back in February so it would have a contractor and pricing lined up and ready to go as soon as the weather breaks. Crossroads was awarded this contract as well. While the contractor focuses on these repairs, city service crews are then freed up to tackle in-house catch basin work and crack sealing. City crews will also be doing asphalt repairs to Abbey and Albion roads in-house. Crossroads began the road rehab program in Bunker Estates. They will also be tackling streets in Cedar Estates; Timber Ridge Estates; Chesapeake Drive; and the Hunter’s Creek subdivision. The streets will receive partial-depth repairs. “This is the third year that Crossroads has been doing the joint repair in our developments. The city service department goes in there before Crossroads, and we repair or replace every catch basin that’s in that development, and then we go back and do the final crack sealing. We want to preserve all the developments the best way we can, so that’s what we are doing with this program,” Cinquepalmi said. In addition to all this work, the entire North Royalton stretch of state Route 82 is another focus with not only the widening between West 130th Street and York Road underway beginning with waterline work and utility relocations currently, but also the upcoming resurfacing, a separate project later this year, of the stretch of Route 82 between York and the Broadview Heights line.